We are offering Injection Moulding Machine and the ranges are available as per customer requirement. These are developed with the help of top notch techniques and are capable of fastening molds in either a horizontal or vertical position. These are tested on different parameters to suit clients’ requirements.These pumps help in energy-saving through matching the pump output pressure and flow, along with the pressure and flow of the running machine. We are manufacturing and exporting optimum grade CPVC Plastic Moulding Machine. 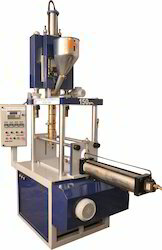 The offered machine is precisely manufactured by our well-trained professionals using premium grade components with the help of ultra-modern techniques in adherence to set industry norms. Moreover, it is checked for its quality on series of quality parameters before being supplied to our clients. It is suitable for moulding CPVC products.